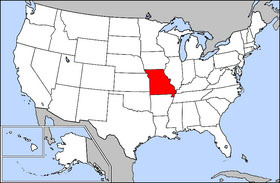 Missouri, named after the Missouri Siouan Indian tribe meaning "canoe", is a Midwestern state of the United States with Jefferson City as its capital. The state's nickname is the Show-Me State; the U.S. Post Office abbreviation for Missouri is MO and the state public university's main branch is located in Columbia. The Mississippi and Missouri rivers are the two large rivers which flow through this state. USS Missouri was named in honor of this state. State Motto "Salus Populi Suprema Lex Esto"
"Let the Welfare of the People be the Supreme Law"
Compare with King Charles XIII of Sweden (1809): "The welfare of the people my highest law". Originally part of the Louisiana Purchase, Missouri was admitted as a state in 1821 as part of the Missouri Compromise. It earned the nickname "Gateway to the West" because it served as a departure point for settlers heading to the west. During the Civil War, Missouri, a slave state, was split with portions adhering to the Union, and others seceding with the southern states. The capital of Missouri is Jefferson City and the current governor of the state is Bob Holden (Democrat). Missouri's two U.S. senators are Christopher S. Bond (Republican) and Jim Talent (Republican). Missouri has 9 districts in the U.S. House of Representatives. The current constitution of Missouri, the fourth constitution for the state, was adopted in 1945 and provides for 3 branches of government, the legislative, judicial and executive branches. The legislative branch consists of two bodies, the House of Representatives and the Senate. These bodies comprise the General Assembly of the State of Missouri. The House of Representatives has 163 members that are apportioned based on the last decennial census. The Senate consists of 34 members from districts divided such that the population of each district is approximately equal. The Judicial department consists of a supreme court consisting of 7 judges. Superior and inferior courts are also provided. The executive branch is headed by the Governor. North of the Missouri River lie the northern plains that stretch into Iowa, Nebraska and Kansas. Here, gentle rolling hills remain behind from a glacier that once had extended from the north to the Missouri River. The Ozark plateau begins south of the river and extends into Arkansas, S. E. Kansas, and N. E. Oklahoma. Springfield, Missouri in southwestern Missouri lies on the Ozark plateau. Southern Missouri is the home of the Ozark mountains, a dissected plateau surrounding the Precambrian igneous St. Francois Mountains. The southeastern part of the state is home to the Bootheel, part of the Mississippi Alluvial Plain or Mississippi embayment. This region is the lowest, flattest and wettest part of the state. It is also the most fertile. It is here that one finds cotton and rice production. The Bootheel area was the focus of the great New Madrid Earthquake of 1811 - 1812. Although now generally considered part of the Midwest, Missouri was once thought of as Southern. For example, Mark Twain, who grew up in Hannibal, Missouri, in Life on the Mississippi described his upbringing as in "the South". Missouri's total gross state product for 1999 was $170 billion placing it 18th in the nation, while its 2000 Per Capita Personal Income was $27,445 or 28th in the nation. Major industries include aerospace, transportation equipment, food processing, chemicals, printing/publishing, electrical equipment, light manufacturing. The agriculture products of the state are beef, soybeans, pork, dairy products, hay, corn, poultry, and eggs.Missouri is ranked 6th in the nation for the production of hogs and 7th for cattle. As of 2001, there were 108,000 farms, the second largest number in any state after Texas. Missouri has vast quantities of limestone. Other minerals mined are lead, coal, portland cement and crushed stone. Missouri produces the most lead of all of the states in the Union with most of these mines in the central eastern portion of the state. Missouri also ranks first or near first among the production of lime. As of the 2000 census, the population of the state is 5,595,211. Major cities include Saint Louis and Kansas City. Its population grew 0.6% (478,310) from its 1990 levels. According to the 2000 census, 84.9% (4,748,083) identified themselves as White, 2.1% (118,592) as Hispanic or Latino, 11.2% (629,391) as black, 1.1% (61,595) as Asian, 0.4% (25,076) as American Indian or Alaska Native, 0.1% (3,178) as Native Hawaiian or Pacific Islander 0.8% (45,827) as other, and 1.5% (82,061) identified themselves as belonging to two or more races. 6.6% of its population were reported as under 5, 25.5% under 18, and 13.5% were 65 or older. Females made up approximately 51.4% of the population. 5.1% of Missourians spoke a language other than English at home. 151,196 Missourians were foreign born. 81.3% were high school graduates (higher than the national average) while 21.6% had a bachelor's degree or higher. The mean commute time to work was 23.8 minutes. The homeownership rate in 2000 was 70.3% with the mean value of the owner occupied dwelling being $89,900. There were 2,194,594 househoulds with 2.48 people per household. The median household money income for 1999 was $37,934 with the 1999 Per Capita Money Income of $19,936. There were 11.7% (637,891) Missourians living below the poverty line in 1999. Approximately 1 out of 5 Missourians holding religious beliefs are Roman Catholics; many of those live in central Missouri as well as around Kansas City and St. Louis. Baptists, Methodists, and Lutherans account for most of those belonging to Protestant faiths. Kirkwood, outside St. Louis, is the headquarters of the Lutheran Church�Missouri Synod. Kansas City is the headquarters for the Church of the Nazarene and Independence, outside of Kansas City, is the headquarters for the Community of Christ (formerly the Reorganized Church of Jesus Christ of Latter Day Saints), and the Latter Day Saints group Remnant Church of Jesus Christ of Latter Day Saints. Springfield is the headquarters of the Assemblies of God. There is an idiom "being from Missouri" which relates to the state's unofficial slogan: "show me" (which even appears on their license plates. People from Missouri have a reputation for being skeptical. Saint Louis -- the largest metropolitan area. Kansas City -- the largest city. Columbia -- the University of Missouri at Columbia. Sainte Genevieve -- oldest permanent European settlement west of the Mississippi River. Hannibal -- where Mark Twain (Samuel Clemens) lived. Saint Charles -- the beginning of the Lewis and Clark Expedition. Jefferson City -- the state capital. Sedalia -- home of the Missouri state fair. Missouri's public school system includes kindergarten to 12th grade and requires all children between the ages of 7-16 inclusive to be enrolled in a school. The University of Missouri is Missouri's statewide public university system, having campuses in Saint Louis, Kansas City, Columbia and Rolla. Additionally, Missouri has several regional public universities in different parts of the state, the largest being Southwest Missouri State University having the second largest student enrollment after University of Missouri-Columbia.